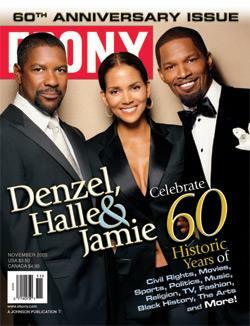 Ebony is a monthly magazine for the African-American market. It was founded by John H. Johnson and has published continuously since the autumn of 1945. A digest-sized sister magazine, Jet, is also published by Johnson Publishing Company. Ebony was founded by John H. Johnson in 1945. The magazine has evolved over the years; in 2010 it began a redesign process to update its longtime brand. In the past, the magazine was persistently upbeat, much like its postwar contemporary Life. Ebony, edited by John H. Johnson, has striven always to address African-American issues, personalities and interests in a positive and self-affirming manner. Its cover photography has focused on prominent African-American public figures, including actors and entertainers, and politicians, such as Dorothy Dandridge, Mariah Carey, Diana Ross, Michael Jackson, US Senator Carol Moseley Braun, President Barack Obama, Zoe Saldana, Tyrese Gibson and Tyler Perry. National Public Radio marked this anniversary edition as the beginning of redesign of Ebony. Former White House Social Secretary Desiree Rogers, of the Obama administration, had become the CEO of the magazine. In August 2008 the magazine had published a special 8-cover edition featuring the "25 Coolest Brothers of All Time". The lineup featured Jay-Z, Barack Obama, Prince, Samuel L. Jackson, Denzel Washington, Marvin Gaye, Muhammad Ali and Billy Dee Williams. 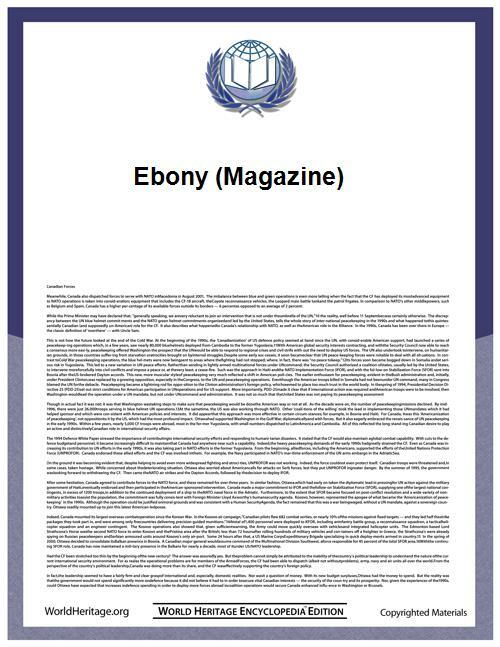 In the 21st century, Ebony frequently makes headlines in the blogosphere and in the mainstream press. The November 2011 cover featured a pregnant Nia Long, reminiscent of the iconic image of actress Demi Moore featured naked while pregnant on a magazine cover two decades before. Some of Ebony′s more conservative readers disagreed with the cover choice, stating it inappropriate to feature an unwed, pregnant woman on the cover. The cover was featured in US Weekly and in a five-minute segment on CNN. Zoe Saldana was featured on the August 2011 issue, and some readers questioned a Black latina cover star. However, the Avatar actress seemed to open Ebony to a new segment: Americans of mixed African-American and Hispanic ancestry. Recent issues question whether President Obama is still right for black America and whether biracial Americans need more acknowledgement in today's society. In June 2010, Ebony ran an article about radio personality Robin Quivers, long-time sidekick of radio host Howard Stern, in which Quivers was asked if she considered herself a "sell out" for working with a predominantly white media. Quivers dismissed the question. In December 2008, Google announced that it was scanning back issues for Google Book Search; all issues from November 1959 to December 2008 are available for free. In 2010, the Johnson Publishing Company sold its historic building to Columbia College Chicago. It moved into a new building in 2011. The company also recently sold a share to Chase Bank so as to secure more cashflow for Ebony, Jet and the Johnson-owned cosmetics line, Fashion Fair. ^ "eCirc for Consumer Magazines". ^ Editors (July 7, 2008). "Ebony: The 25 Coolest Brothers Of All Time". TaleTela. Retrieved January 3, 2009.